Is your dryer on the list? Mike works with two Dryer Master DM510s. with the first one having been purchased almost 20 years ago. Both DM510s run on ffi dryers. The site dries about 600,000 bushels of corn per year. What convinced you to buy a Dryer Master in the first place? We were convinced to buy one because our neighbors and the local co-op had one. Compared to manual sampling how much difference does having real time moisture information make? How much training was required to operate the Dryer Master? It is fairly simple to operate. Not much training is required. Have you contacted the Dryer Master Support Center? What was your experience? We have contacted the support center. They have always been very helpful and timely in getting the Dryer Master running again. 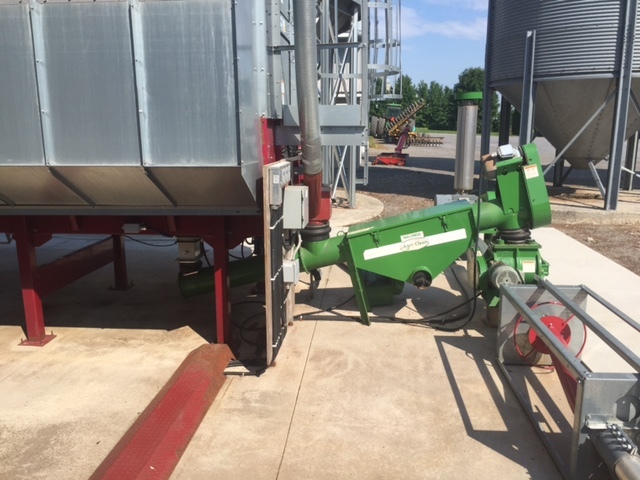 This entry was posted in Agriculture Industry News, automatic grain dryer controller, Automatic moisture controller, Control Technology, Dryer Master Experiences, Drying, grain dryers, Grain Drying and tagged DM510, ffi dryer, grain dryer, tower dryer. Trevor dries less than 250,000 bushels annually of corn and wheat with his Grain Handler dryer. He has had his Dryer Master DM510 for three seasons now. What had you heard about Dryer Master before you purchased one? Advanced Grain Handling suggested a Dryer Master because that is what they had and really liked it. We wanted something that was smart phone capable and we are glad we got the Dryer Master. Why did you buy a Dryer Master in the first place? To be more productive… We couldn’t run 24 hours a day before the Dryer Master because we didn’t want to under dry or over dry.. with the Dryer Master we can run 24 hours a day which is huge to getting our crop off before the weather changes in North Dakota… Every day is crucial and we have to be able to get the crop off and dry it down! We decreased paying a guy to baby sit the dryer all day. With Dryer Master we can look at our phones when we are not by it. Semi drivers and always monitoring it when dumping their trucks. We dialed in our set point for our dryer and it comes out consistent throughout our desired moisture for storage. Did anything surprise you about how your Dryer Master worked when you first used it? It took awhile to get used to it and a lot of phone calls just to get everything set but now we are familiar with everything. Any kind of product that can give you a return on your investment is crucial in this business. This monitoring system pays for itself yearly in our eyes with the elevators being so aggressive on drying and shrink charges. 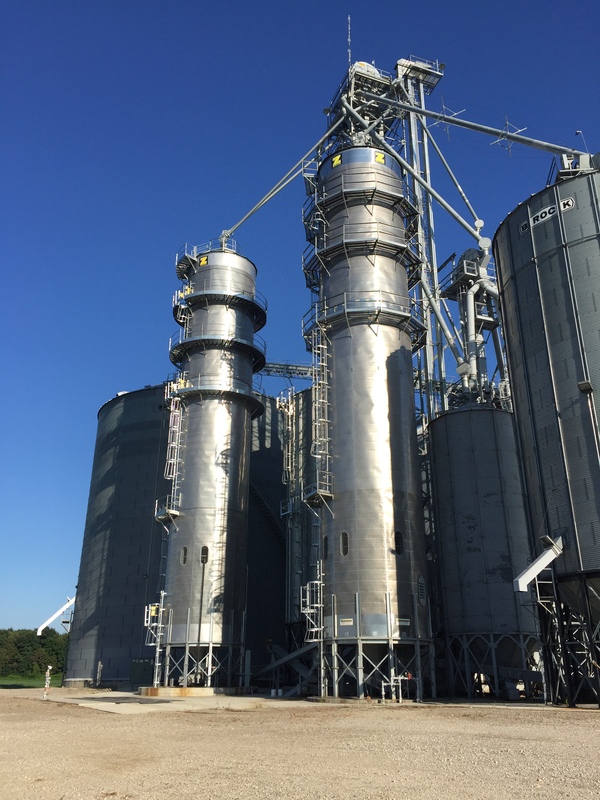 This entry was posted in Control Technology, Dryer Master Experiences, Drying, Grain Drying, Grain Handler dryer, Moisture Sensors, Uncategorized and tagged control technology, corn, DM510, dryer master, grain dryer, grain drying, Grain Handler, moisture control, wheat. Kevin has two Dryer Master DM510s. The first one he installed about 15 years ago. He then he bought a second one five years ago to go on his new dryer. Kevin’s two dryers are both Zimmerman towers (one is 2,000 bu. and the other 4,000 bu.). Kevin recently updated his DM510s with DM Mobile, Dryer Master’s remote access application. (DM Mobile is standard on all new DM510s, but it can also be added onto older DM510s allowing owners to add the latest in remote access capabilities to their dryer at a reasonable cost). What had you heard about Dryer Master before you purchased your first system? I talked to a guy who owned one and he told me that I would not want to dry another bushel without it. I was surprised with how accurate the sensors are & how well they keep their calibration. The sensors are also very durable, I had one sitting in rotten corn and water all summer and did not know it, cleaned it off and it still worked as it should. What drying tips (if any) would you like to pass on to other dryer owners about how to get the most out of their dryer and/or their Dryer Master? We found that the Zimmerman dryer will make fairly large swings in moisture at first, 1.5 – 2 pts, but once it found its sweet spot it stayed on target. How much difference does it make to have real time moisture information versus having to go out and take a sample? It is a huge difference being able to walk in the office and know what my moisture is in real-time and be able to keep an eye on it while unloading trucks and all the other things that are going on. It’s great knowing how accurate it is vs. taking a sample from say maybe 2 columns at best, whereas the sensor (through the printout) gives me summaries every 10 minutes from a much larger sample size, giving me not only more accurate information, but also more useful information, and it’s better than doing it myself. Do you use DM-Mobile? If so how do you use it (phone/PC/home/at night? ), how often do you use it? All the time when it is running, I no longer have to make midnight runs to the dryer to check on it, I can check on it without having to get out of bed. This entry was posted in Control Technology, Dryer Master Experiences, Drying, Grain Drying, Moisture Sensors, Uncategorized, Zimmerman grain dryer and tagged DM-Mobile, DM510, dryer master, grain dryer, grain drying, moisture sensors, tower dryer, Zimmerman grain dryer. Larry dries about 15,000 tons a year of corn, wheat, soybeans and canola and he has used Dryer Masters for the last 3 years. Larry has a rather unique setup with 2 Dryer Master DM510s on his Grain Handler 4020 grain dryer (40 feet long, 20 sections high). Each DM510 controls one side of the dryer, with each side having its own separate drive. And yes, the two sides of the dryer will often run at different speeds. 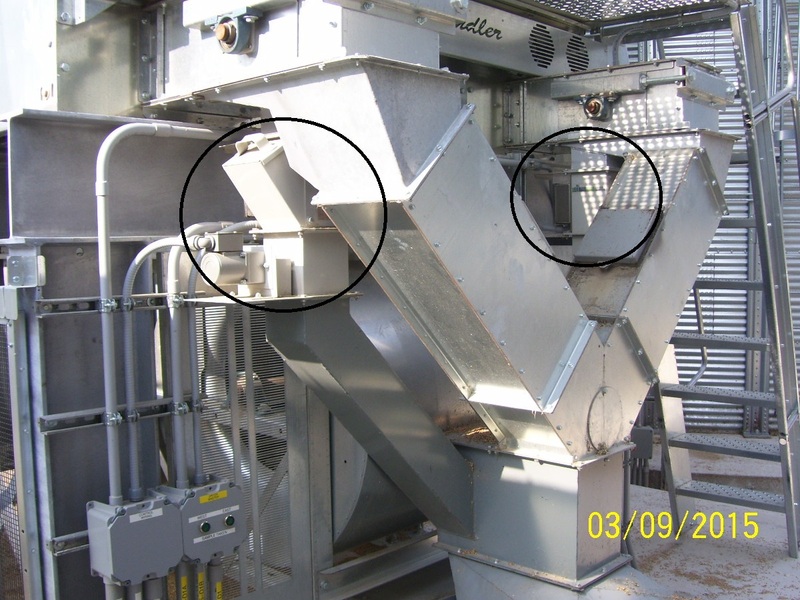 The picture to the side shows two of the newest Dryer Master sensor chutes with a rotary feed (highlighted with the black circles). To get a reliable controller for the dryer. How does the Dryer Master change the way that you dry, or help your drying operations from an operational perspective? Makes life easier not having to keep adjusting the output of the dryer. We had had one on our older dryer (an MC 1195) but with the Grain Handler it seems to want to take control faster and is more consistent. How much difference does it make to have real time moisture information versus having to go out and take a sample. It’s a huge difference because at harvest time it gets busy unloading trucks and grading samples. I used to take moisture samples every hour but now with where the inlet and outlet sensors are, they are really accurate, so now if there is a lull with crop coming in I will take a sample, maybe twice a day. What drying tips (if any) would you like to pass on to other dryer owners about how to get the most out of their dryer, their drying operations, and/or their Dryer Master? After talking to Wolf at Dryer Master we started using 2 wet bins, so we dry the corn that came in yesterday, today (having let it sit a day). Really made the corn easier to dry – especially the first of the harvest. It seems to bring the moisture closer to the tip of the kernel. 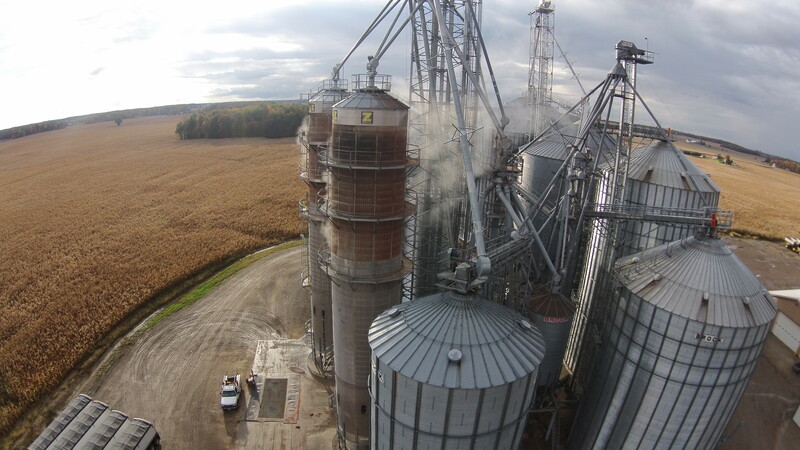 This entry was posted in Control Technology, Dryer Master Experiences, Drying, Grain Drying, Moisture Sensors and tagged corn, DM510, dryer master, grain dryer, grain drying, Grain Handler, Grain Handler dryer, Moisture sensor, soybeans. Anthony has 2 Dryer Master DM510 systems, the first of which he added in 2007. He runs them on his two Zimmerman dryers, drying about 1.5 million bushels/year of corn and soybeans. This year he will be adding the DM Mobile remote access functionality so that he can check on his dryers at any time from anywhere. We purchased DM because any of the factory controls we had tried just did not work. We spoke to a neighbor that was running a DM at the time and they were completely satisfied. The DM was money well spent and I would not run without. The DM allows me to be more available during harvest season. I do not have to babysit the dryers all day and night. I just have much more confidence in the DM sensors and don’t feel I have to check constantly. How often do you calibrate the moisture sensors? I try and calibrate every chance I get. It seems once the dryers have been running a while I have to calibrate less often. I try to check it every couple hours. And what is your calibration procedure? My sampling procedure is this, for the input sensor I take several samples from the leg that is feeding the dryer. I average the moistures and wait about 12 min and start the calibration on the DM. For the output sensor I hit the green button and take small samples the entire time the light is flashing (30 seconds). I run that sample through the tester about 3 or 4 times and enter in the average moisture. You run two dryers. How do you allocate product between the dryers? Normally for the first half of harvest one dryer is drying corn and the other soybeans. When I have them both in corn If we are harvesting inconsistent moistures I try to keep one drying higher moisture and one in the lower. We then unload both dryers into the same bin to get some blending between both of them. Have you found a financial difference in your drying performance using Dryer Master? In what way? The DM system has saved us time and money. I have consistent moistures coming out of the bin, we are not over drying like we did with previous controls, and the system is user friendly. This entry was posted in Control Technology, Dryer Master Experiences, Drying, Grain Drying, Moisture Sensors and tagged DM510, dryer master, Dryer Master Experiences, grain dryer, grain drying, moisture control, Zimmerman grain dryers. Jon is relatively new to Dryer Master but he is great example of how moisture control is no longer just for big elevators, and how more and more it is making its way into smaller operations. Jon has a DM510 system and has had it for 2 seasons now. He added it as a retrofit onto an MC dryer and dries about 300,000 bushels a year of corn and soybeans. We had been having issues with the original controller, the dryer had to be babysat 24/7. With just myself looking after the elevator during harvest it became very necessary to find a controller that I could trust so that I could get some sleep and be functional the next day. It has given me a lot more confidence in my drying system which allows me focus on other parts of the system which need my attention during the course of the day. Once its up and running I check the calibration once in the morning and once more before I head to the house for the night. With the Dryer Master running I just don’t stress about my dryer anymore. I thought it would be more complicated to run than it is. I was completely comfortable running the system within just a couple of hours. The over the phone support is great, everybody at Dryer Master seems to know the system like the back of their hand. Give the system time to react if you make changes to the settings. 1-1.5 hours depending on how fast the dryer is running. Too many changes in a short period of time will have you frustrated and chasing your tail. Once the Dryer Master is up and running it takes very little interaction to keep it going. Let it work and find something else to fuss over. The biggest financial gain for us would be the accuracy that it can discharge grain at the correct moisture. We have noticed that when shipping grain out, our bins are much more even top to bottom, with no wild swings in moisture. Over and under drying used to cost us every year, now its pretty much a non issue. Yes, definitely. This is a huge benefit to my operation. I use it throughout the day from my Iphone, and also at night from my Ipad or Iphone. I can wake up a couple times through the night, see whats happening and get back to sleep. It has made the harvest season mush easier to get through. My days run much smoother because I’m not completely exhausted from being up all night with the dryer. This entry was posted in Control Technology, Dryer Master Experiences, Drying, Grain Drying, Moisture Sensors and tagged agriculture, control technology, corn, DM-Mobile, DM510, drying corn, grain dryer, grain dryer control, grain drying, Mathews grain dryer, MC dryer, moisture control, Moisture sensor, soybeans. Myron has worked with Dryer Masters systems for over 10 years. He currently uses two DM510s on two Zimmerman 4500 tower dryers, typically drying around 4 million bushels of corn a year. In the first photo you have the DM510’s sitting side by side, along with the printers that Myron makes good use of. The bottom picture shows a slightly unusual sensor placement (the conduit runs to the back of the moisture sensor). We can generate a printout tape to evaluate the functions over night or during the day. To monitor moisture ranges. During start up – give it plenty of time to learn and if possible they work the best if you don’t shut down, and run 24 – 7. Have you f ound a financial difference in your drying performance using Dryer Master? Yes, more consistent for moisture blending. 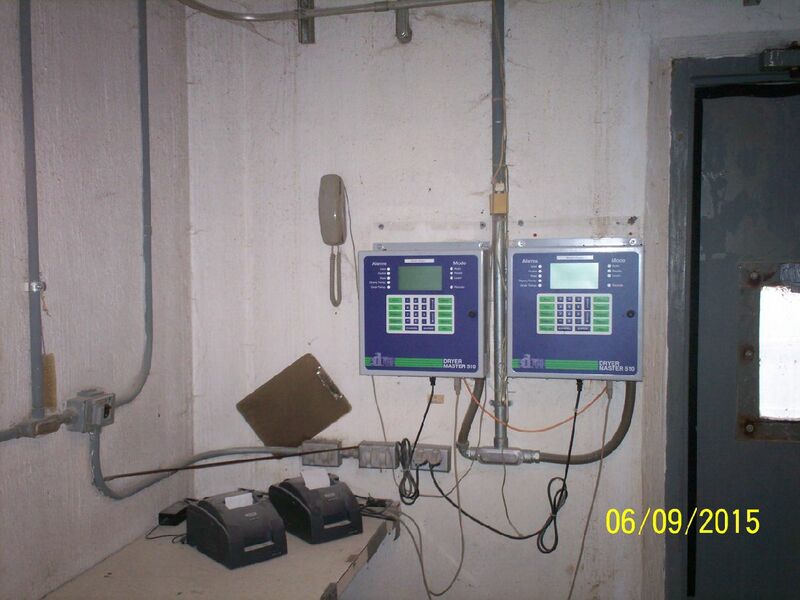 This entry was posted in Control Technology, Dryer Master Experiences, Drying, Grain Drying, Moisture Sensors and tagged agriculture, control technology, DM510, dryer master, drying control, grain dryer, grain drying, moisture control, moisture sensors, Zimmerman grain dryer.